Dr. Meakings joined the Aldergrove team in February 2017. 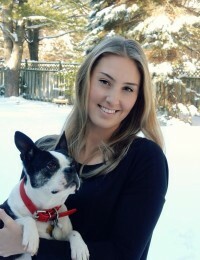 After graduating from the Ontario Veterinary College in 2015, she practiced at a companion animal clinic in Mississauga. Her special interests within the veterinary field include dermatology, internal medicine, nutrition and pain management. Dr. Meakings loves getting to know clients and their pets. She strives to practice with compassion and enjoys the opportunities and challenges that each day brings! During her free time Dr. Meakings enjoys traveling, playing volleyball and spending time with family and friends in Muskoka. She shares her home with her husband and their crazy Boston Terrier, Fuller. Dr. Meakings is currently on Mat leave.